what they are looking at! 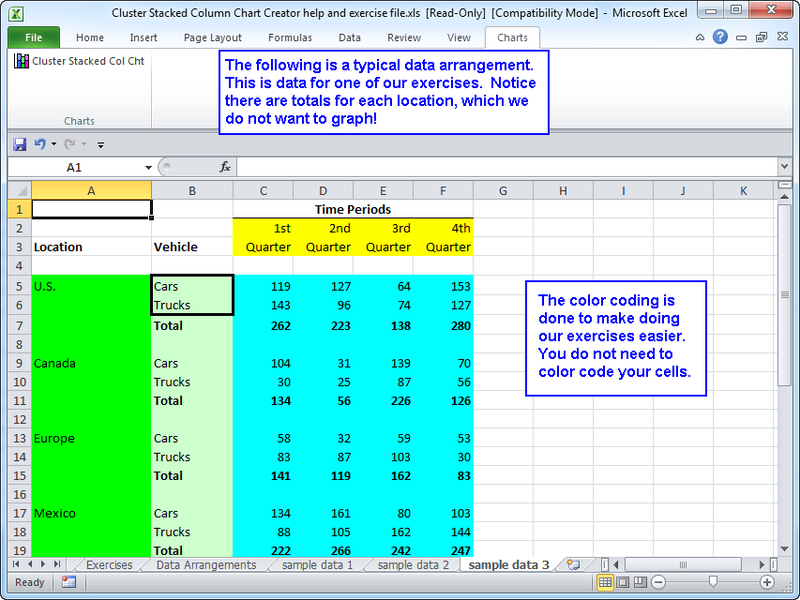 The Cluster Stacked Column Chart Creator add-in for Microsoft Excel makes creating such charts very easy. It is compatible with Microsoft Excel 2007 to 2019 and Office 365. The entire process is menu driven. In order to create a cluster stacked column chart of arrangements 2-6, one normally would have to manually re-arrange the data, which is painful. However, the Cluster Stacked Column Chart Creator can easily create the different data arrangements. And then one can use the Cluster Stacked Column Chart Creator to graph them. So, in just a few minutes of use, one gets six cluster stacked charts, not just one.